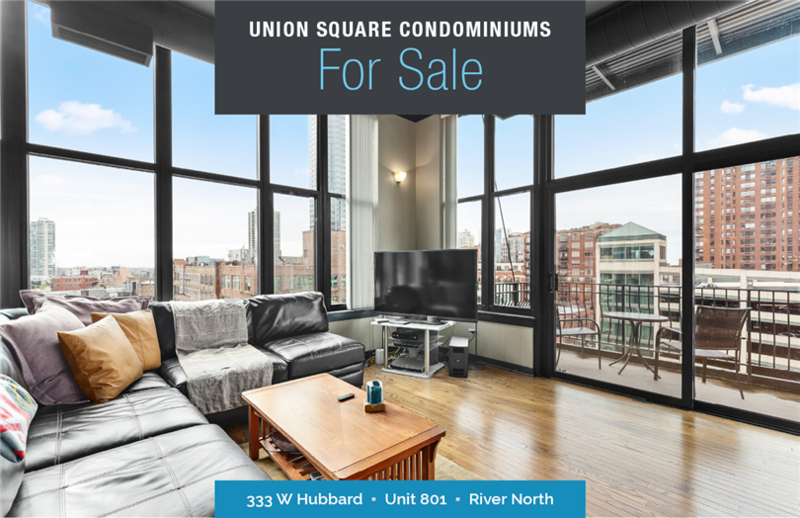 Rarely available, this fabulous & dramatic corner unit loft home in the penthouse section of Union Square is now ready for a new owner! Over 1900 sq. ft. With gorgeous hardwood floors throughout, 2nd bedroom has newer carpeting. Robust kitchen has granite & ss appliances. Endless and amazing views from a private 35 ft balcony. The open layout boasts a split floor plan which is superb for entertaining. Massive living space, extra-large windows that open and allow glorious sunsets and breezes. Assessments include a/c, heat & basic cable. Includes a reserved heated secure garage parking spot. Across from Merchandise Mart, super close to East Bank Club. Easy access to restaurants, galleries, EL, Metra & expressways.